ALPCA: Dr. Roy Klotz Jr.
Home > ALPCA Hall of Fame > Dr. Roy Klotz Jr.
Wonder what a 1954 New Hampshire plate looks like? Or how about one from Ethiopia? Go to the ALPCA archives on line and your curiosity will be rewarded. Dr. Roy Klotz Jr. is the man who has built, nurtured and maintains the archives that all plate collectors rely on. Hall of Fame member Roy Carson took reams of notes to initiate the first library of license plate materials, which appeared in newsletter articles. Roy took all of Carson's published feature articles and compiled the data onto a computer file. Those files evolved into the club archives that members view and add to on an ongoing basis. He has not sought praise for these efforts although it is certainly overdue. Rather, he has gone out of his way to shun praise and thank all the others notably Roy Carson, Jeff Minard and Bill Caswell for their assistance in making the archives a truly "living" thing. That is a bit ironic given that Dr. Roy Klotz Jr. was a medical pathologist in Eastern Montgomery, Pennsylvania, which is a suburb of Philadelphia. Guess that makes Dr. Roy Klotz Jr. the clubs own personal C.S.I. official (that's Collection Service Inspector for those of you with crime scene investigator on your mind). Roy found ALPCA in 1977 or should that be the other way around but he has been a collector of plates for more than forty years. If you have been to a national convention you have observed Roy with his digital Nikon in hand photographing the obscure and seldom seen tags for the archives. He is credited with the most amazing discovery in the history of plate collecting. In 1985 he ran an advertisement in a Jackson Mississippi newspaper seeking old Mississippi license plates. He received a letter from a non-plate collector in Jackson stating that he had 1913, 1919 and 1921 plates, which he would be willing to sell. Not believing the letter he contacted the man and arranged to have the plates sent to him for approval. To his astonishment it was indeed the first ever known dated 1913 Mississippi plate. For a period of 72 years no plate collector had ever known that Mississippi had indeed issued dated plates in 1913. The state first issued plates in 1912 and was soon hit with a class action lawsuit as no legislation had as yet been enacted permitting the state to tax residents via forced motor vehicle licensing. It was believed that all continuing registrations were suspended while the suit was ongoing and collectors had no indication that the state had issued 1913 dated plates. That suit was not concluded until 1914 and the state lost. To get your money back a resident was obliged to return one's dated 1912 tags, which is why less than a dozen of those survive. The subsequent discovery of a second dated 1913 tag validated Dr. Klotz's discovery that opened up an entirely new chapter in plate history. Discovery and meticulous details are part of his life. 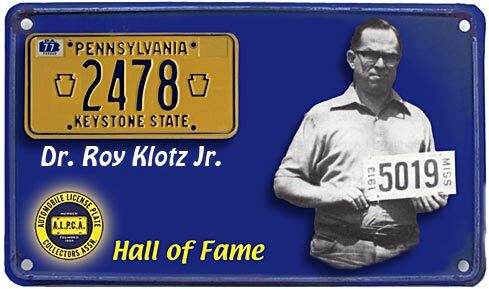 For his truly selfless dedication to the hobby the membership of ALPCA is privileged to honor Dr. Roy Klotz Jr. as a member of the Hall of Fame.